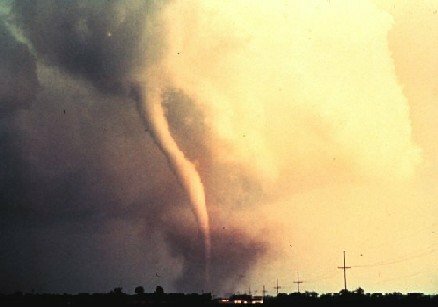 Low Risk Observation of Tornadoes - is it Possible? Yes it is, either by learning from others, or by taking advantage of the many ways of observing weather from a distance. But first, if you would like some quick revision on causes andcharacteristics, detour for a few minutes to the Tornadoes page. I am sure that all of us would like to see a tornado in action. The real question here is how much control we have over the distance to the tornado, as opposed to how much control the tornado has over the distance to us. So may I suggest the first rule in tornado observation should be to plan an escape route. The second important consideration is to remember that tornadoes are always associated with thunderstorms, and the larger tornadoes are most commonly associated with the largest thunderstorms , the supercells. That means that you will need to be aware of the other features of large thunderstorms - large hail, strong straight line winds which may carry blinding dust, sand and larger debris, lightning and torrential rain leading to flash flooding. There's no doubt it would be a huge buzz to see a tornado at close hand, but its not the best sort of exploit for the inexperienced. More about that later. One way is to join up with people who already have that experience. You could start by becoming a storm spotter. Spotters are people affiliated with the National Weather Service as observers in times of severe weather events - no matter how good radar and satellite imagery is, it is not yet capable of identifying every tornado, downburst, large hail occurrence or flash flood, and the NWS needs eyes on the ground (I don't mean that literally!). If storm spotting interests you, contact your nearest NWS Office - they offer training sessions which will help you improve your weather identification skills, and provide valuable training in risk minimization in the dangerous surroundings of Severe Weather. Apart from the contacts you will make, you will probably learn something of the ultimate adrenalin rush - storm chasing. While most storm spotters are happy to observe and report, there is a little overlap and contact with the more aggressive chasers of storms, and with luck, tornadoes. But that's another story. There is another way of observing tornadoes and severe storms which can be done over the net from your own home. Not terribly macho, but it is an opportunity to watch severe weather events in real time. It requires access to tornado and storm watches and warnings through the Storm Prediction Center, and access to SPC's Storm Reports, which includes tornadoes. These are almost real time reports of severe weather by spotters, NWS personnel, or law enforcement and emergency service staff. Add local radar and satellite imagery to the list, and you'll get a pretty fair idea of the progress of a major storm. If you are lucky you might find an online weather station in the area. Check out Weathernet - it's something of a lottery as the spread of stations is a bit thin, and some of those listed may be inactive. OK, I know it's a bit secondhand, but at least it's real, and should be better than watching reruns on TV. Supporting resources on tornadoes, including the best of available books, DVDs and posters, can be found at More Tornado Resources, while this link will get you back to the main Tornado Information Page. This link will take you back to the Top, or, when you're ready, here's how to return to the Home page.